In both the Old and New Testament, we are told to love God with all our heart, and soul (Deuteronomy 11: 13), and (Christ Jesus continues) with all our mind and follows with the second great commandment – to love our neighbor as our self. (KJV Matt 22: 37-39) We are capable of doing this because it’s man’s response to God’s ability. Made in the image and likeness of Divine Love, Love is the law of our being. We can respond with Divine Love and remember Love heals us. to me. But I will try to do better about that in the future. Thank you, Laurette! I’m so happy you liked the message. Believe me, we all are challenged about reacting. 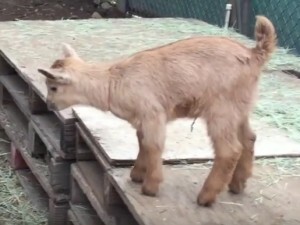 I’ve been trying to have this little kid goat remind me not to react. Our pure motive to try and catch ourselves and correct it is powerful. Step by step Love leads the way. thank you Marsha and Bill! Love what you are doing!! Thank you, Sandy, for writing. I’m very grateful for your support and hope you will share this website and it’s message with others. Love it! Darling photo too! You should submit this as a “spiritual short”. Thank you, Cathryn. I’m going to follow up on your suggestion. I appreciate your support and helpful comment.